In large bowl, gently mix the turkey, 4 tablespoons of the parsley, the tapenade, salt and 1/4 teaspoon of the pepper until blended. Shape mixture into 12 small patties, about 1/2 inch thick. Spray grill pan with cooking spray; heat over medium-high heat. Add patties; cook 6 to 8 minutes, turning once, until meat thermometre inserted in centre of patties reads 165°F. Meanwhile, in small bowl, mix yogurt, sour cream, chopped cucumber and remaining 2 tablespoons parsley and 1/4 teaspoon pepper. 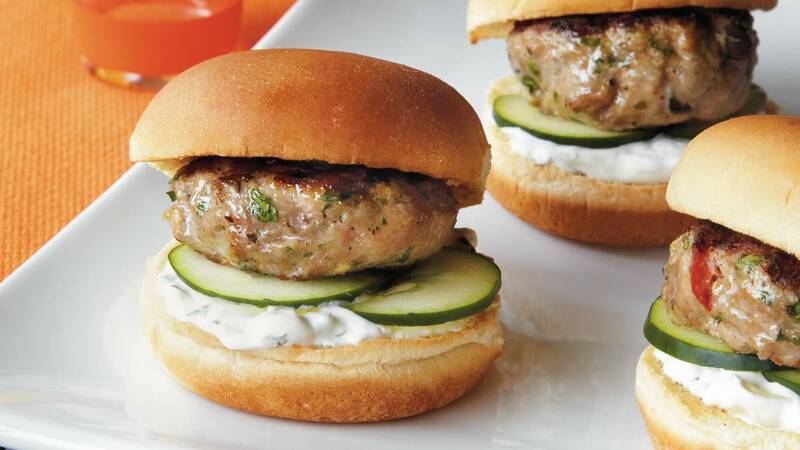 On each bun bottom, place about 1 heaping tablespoon yogurt sauce, 2 cucumber slices, and 1 patty. Cover with bun tops. Technique Tip To toast mini buns, heat oven to 450°F. Place buns, cut sides up, on baking sheet. Bake 5 minutes or until warm and lightly browned.